Here at Rushall we are very proud of our creative and innovative approach to English. We firmly believe in creating firm foundations by developing excellent communication skills from the earliest point. We believe that speaking, listening and communication skills, along with enjoyment of stories and books are paramount to success. Along with fostering a love of books we believe children should be given meaningful first hand experiences through which to inspire their writing. Rushall Rabbits- we begin here in our parent, baby and toddler group. Our use of Makaton signing aids communication for all children. Well Comm and Talk Boost speech and language interventions are in place for children who need them. Sentence Stems are used across school to develop articulation and vocabulary. Partner Talk is embedded across school. Role Play and recordable technology are used to encourage speech. 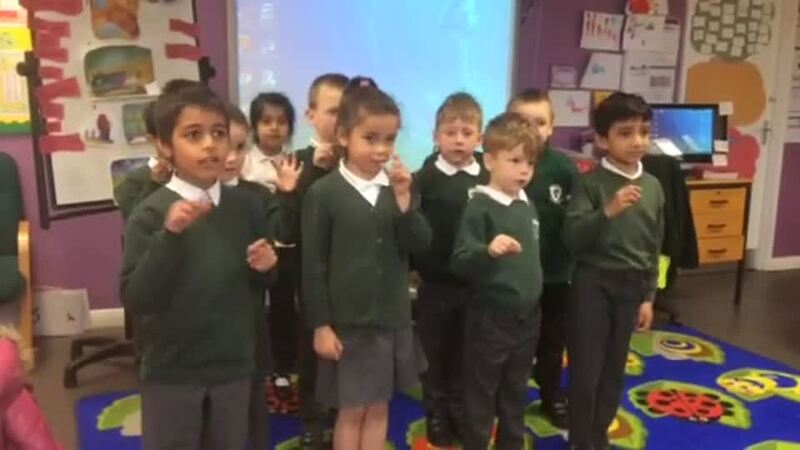 We encourage children to orally re-tell traditional tales. RWI phonics is taught from Nursery using puppets and songs. Story Time Phonics is taught in ARP. Home Reading Books – we use book banding rather than set schemes to enable greater choice. We use high quality texts linked to creative whole school topics. Nelson Comprehension is taught in Key Stage Two. Our award winning library is run by pupil leaders. All children have a reading buddy from an older or younger class. To encourage Reading for Pleasure we use the Accelerated Reader programme for Key Stage 2!! For lots more information about reading and how you can help your child learn to love reading please refer to our 'Reading' page. We use our creative curriculum for inspiration! We encourage independent writing/ editing and re-drafting. Through our pupil leadership there are opportunities for all to write for meaningful purposes. Our children learn how to communicate safely in a modern world through blogging and writing articles for our school newspaper; ‘The Rushall Dragon’. ‘Dough Disco’, ‘Squiggle while you Wiggle’ and ‘Finger Gym’ help to strengthen fingers and aid co-ordination. We use a multi -sensory approach to learn letter formation. Children are taught correct letter formation from Nursery. Children are taught to join their writing as soon as they are ready. RWI Spelling is taught in years 2-6 to embed the phonics taught in Early Years and year 1. Spelling log books are used to practise the spelling focus of the week. Children play spelling games and learn spelling rules. Children are taught to use dictionaries confidently. We aim for all of our children to read for pleasure therefore reading is the most important homework of all! This will ensure that your child has a large store of vocabulary and ‘story’ language in their heads to draw from when they are writing! Spelling log books encourage independent learning.